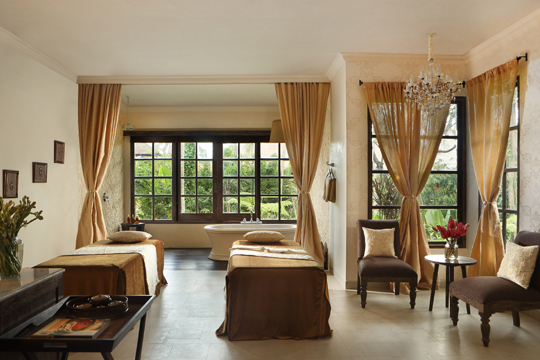 DaLa Spa in the beautiful Alaya Resort Ubud is a palace of pampering. In ancient Sanskrit, dala means leaf. As a child of Mother Nature, the leaf is a symbol of the eternal cycle of life and man’s quest for vitality. A leaf is a source of nutrition; it also provides shelter and has extraordinary nurturing qualities. If you can eat it, you can apply it! DaLa Spa uses only the freshest local ingredients, which are totally edible, in its menu of age-old Indonesian beauty rituals. Named Asia’s Best Boutique Hotel Spa, the award-winning status is further proof that nature is always right. The spa decor is delightful, exuding old-world glamour with lustrous raw silk textiles, hand-blown glass lamps and traditional alang-alang thatched roofs. It is a warm and inviting haven of spa and wellness pampering. DaLa’s stylish lounge and delicious spa cuisine create the perfect well-rounded spa retreat. Honouring Indonesia’s authentic healing modalities, the spa’s expertly trained Balinese therapists are highly skilled and are truly interested in sharing centuries of local knowledge with spa guests. Utilising the natural bounty of organically grown produce sourced from the region and beyond, DaLa boasts one of the most expansive spas in Ubud and Kuta. In addition to treatments, guests may also learn how to make natural spa products and jamu, an Indonesian health tonic.